Groups more than 15 persons get 20% discount. You can rent a boat for private tours all year. Meet 15 minutes before departure time. Groups of more than 9 persons can for weekdays book seats for departures. or send a request via: Booking. 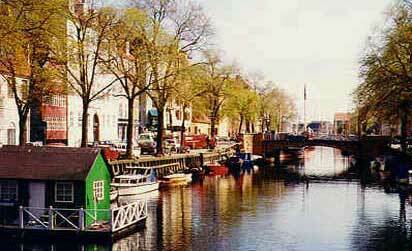 Take a 60 minutes harbour and canal tour onboard one of the blue Netto-Boats. Sit down and make yourself comfortable. 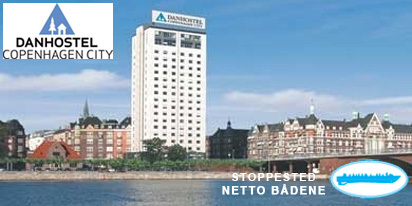 See Copenhagen from the water front and enjoy the scenery and the sights which we pass on the tour, while our guide tells you in Danish, English, and German about the sights. Holmens Church and Nyhavn at Heibergsgade. Autumn/Winter (October-March): We sail with glass roofed heated boats. The tour starts from Holmens Church. We pass the old Stock-Exchange and sail through a canal called "Børsgraven". 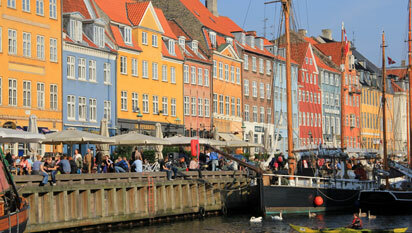 We arrive at Nyhavn, a pictoresque canal with atmosphere, many old houses and sailships. Nyhavn is one of the oldest parts of the Copenhagen harbour and dates back to 1673. At the end of Nyhavn there is a large anchor, which is a monument for 1600 Danish sailors, who lost their lives during the second world war. 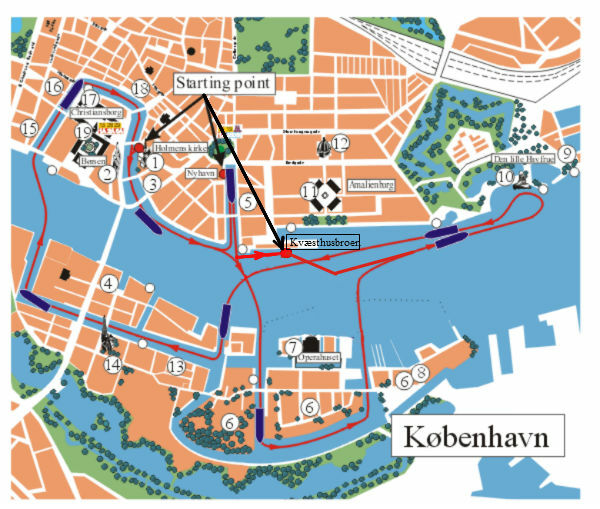 We now approach the area of Holmen which was the naval base of Copenhagen for more than 300 years. Holmen is situated on 4 islands. On Frediriksholm we have The Danish Film School, The Drama School, The Academy Of Rhythmic Music and The Royal Danish Academy of Fine Arts Architect School. To the left you can see "Dokøen" (the Dock Island) and "Frederiksholm" and to the right the Arsenal Island. We sail past some of the 250 years old bastions or powder magazines, one of which – Frederiks Bastion – has been restored and converted into a small art gallery. Leaving the area of Holmen you can see Nyholm, the fourth island of Holmen, where there is still a naval college. To the right you can see the old Mast Crane from 1748, which was previously a well known landmark at the entrance to the Copenhagen harbour. Finally you can see the Battery Sixtus built in 1736 – 1744. We are on our way to The little Mermaid illustrating one of the fairy-tales written by the Danish fairy-tale writer Hans Christian Andersen. We pass the royal residence called the Amalienborg Palace and enter the picturesque Christianshavn’s Canal with Our Saviour’s Church with the famous, twisted spire. Leaving Christianshavn’s Canal we see the Royal Library on the water front, cross the inner harbour. We enter Frederiksholm´s Canal with the Royal Arsenal Museum and the National Museum. To the left after the bridge you can see the old Fishmarket and the Thorvaldsen Art Museum. On our way back to Holmen´s Church we sail past Christiansborg Palace, the seat of the Danish parliament. Today 4 boats are sailing. From Nyhavn approx. every 20. minute. From Holmens Kirke approx. every 40. minute. 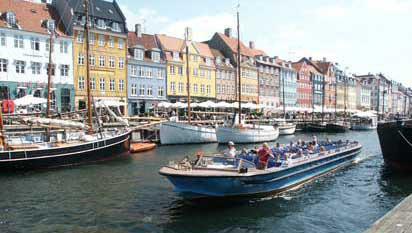 It is possible to use your Copenhagen Card for a tour with the blue boats. Just show us your valid Copenhagen Card at the ticket counter. We look forward to welcoming you on our boats.